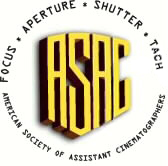 The American Society of Assistant Cinematographers is an honorary fraternal organization of professional men and women who work as camera assistants -- either 1st AC, 2nd AC or Loader, membership by invitation, based upon nomination and evaluation of merit by the ASAC executive board. Our motto is "I never break a sweat until dailies." Our organization is a somewhat reactionary group, created in self-defense to give credibility and status to camera assistants who, as all camera assistants know, have the most difficult job in the camera department. We just didn't think it was fair for Directors of Photography to be able to suffix their name with the prestigious "ASC", and for camera operators to have "SOC", while we continued along in relative obscurity. The primary purpose of the ASAC is to recognize and nurture excellence in the field of camera assisting and to encourage development of both technology and production methods which will help our members achieve that excellence. And like that. Much thought was put into the selection of the organization's name, and the final choice was made after considering a number of names that, for one reason or another, were determined inappropriate. Our original choice, the American Society of Professional Camera Assistants was rejected when it was decided that the acronym might be confused with the animal rights group. Also rejected was the American Society of Assistant Photographers. Home | Focus | Registration | Discussions | Reference | Resources | Chat | Feedback | Problems?